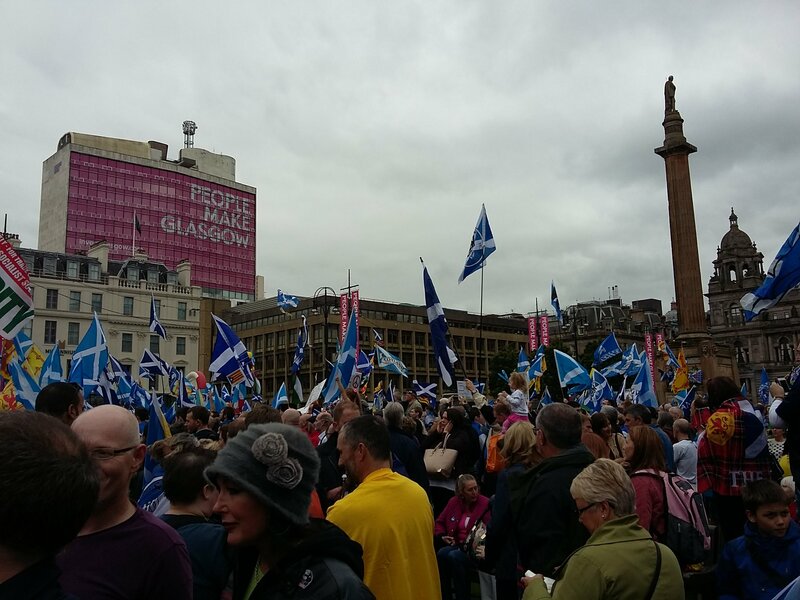 Freedom Square in Glasgow today, one year and a day after the independence referendum. I’m just back from the Hope over Fear rally in Glasgow that was held to commemorate the independence referendum. It was great — a fun family outing like the ones we used to attend all the time during the referendum campaign. The kids know the routine — going to the face-painting stall and wearing huge Saltires — and they love it. I met a lot of friends from the Yes campaign there. Most of them are SNP members today, but of course there were people from all pro-Yes parties and none. However, the SNP wasn’t officially involved in the event, and as far as I could tell, there weren’t any MPs or MSPs there. It was almost as if they’d been told not to attend. I can understand if people in SNP HQ are worried about sharing a platform with Tommy Sheridan and about helping the Greens and the SSP in the fight for the crucial Holyrood list votes, but boycotting the post-No Yes events is a monumental error. At least 95% of the people at the rally today were there because they saw it as a Yes event, and they couldn’t care less who the organiser was. Yes supporters have a huge need for Yes marches and rallies to keep the flame alive, and Tommy Sheridan’s Solidarity party is simply filling the void left behind by the SNP. As a result, the ordinary punter can easily get the impression that Tommy Sheridan cares much more about independence than the SNP, which is obviously completely and utterly wrong. If Alex Salmond or Nicola Sturgeon had been there today, they would of course have got a much bigger cheer than Tommy Sheridan, and it would have given them a great platform to explain why a list vote for the SNP is the best way to get independence soon, and probably more effective than giving the second vote to one of the smaller pro-Yes parties. I’m not saying the SNP needs to share a platform with Solidarity if they don’t want to. They could create great Yes events together with the Greens, the SSP and the surviving Yes groups such as Women for Independence and Business for Scotland, and of course the vast majority of SNP members would choose to attend the events organised by their own party. Also, the turn-out was excellent today, but if the SNP organised and publicised an event (such as a march and rally in Edinburgh on the independence anniversary), it should be quite feasible to get at least 100,000 people to attend, and that would really get Westminster’s attention. As I’ve argued before, we need to campaign for independence now in order to get the support up to a level where a new referendum is inevitable. We can’t simply focus on party politics and hope that support for independence suddenly increases on its own. Two percent of Scots have joined the SNP over the past year because they think it’s the best way to get independence soon. However, my gut feeling is their support is dependent on a strong commitment to independence, and that means the SNP has to be seen to be leading the continuing Yes campaign. The SNP should have had a strong official presence on Freedom Square today. Totally agree with your comments re campaigning. To keep Indy supporters spirits up campaigns need to structured and ongoing, not simply because they can be enjoyable but because they can be educational and informative for uncommitted individuals and soft No voters. The only justification I can see for the SNP ‘sitting on their hands’ is if they intend to really come out with a much more positive and aggressive campaign once a referendum date is set – but then they have to hope they get their timing right. In the latter case, they won’t be giving much notice to other Indy oriented parties and YES groups such as WfI and RIC, who are generally much more effective at persuading individuals and getting out the vote. Yes, I totally agree. It could be that the SNP found the whole experience of working with Yes Scotland some irksome that they’ve decided to work on their own from now on. But they don’t even make many big events just for their supporters, so I’m not sure that’d explain it, either.